For more than half its life, Lower Manhattan’s iconic Woolworth Building has been off-limits to all but the lucky few employed in its handful of professional office spaces. While the lobby has been technically closed to the public since World War II, the management doubled down on its policy after 9/11, erecting the infamous “TOURISTS ARE NOT PERMITTED” sign much bemoaned by local architecture buffs. But when the Gotham gem celebrated its 100th birthday this past April, things began to change. 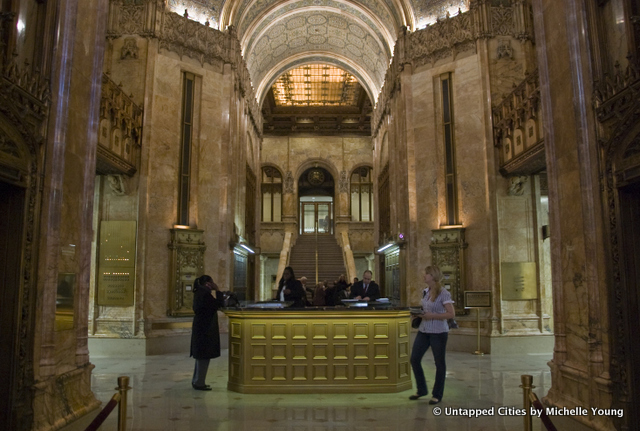 Helen Curry, the great-granddaughter of Woolworth architect Cass Gilbert, organized a series of events in honor of the centennial, including tours of the building’s fabled lobby. Untapped Cities was lucky enough to cover an exclusive sneak peek lead by Carol Willis, curator of the Skyscraper Museum’s “The Woolworth Building @ 100” exhibit. On Wednesday, November 6th at 6:30pm, we’ll be offering readers the chance for intimate, hour-long tour led by Jason Crowley, a preservationist and architectural historian who is working to digitize and catalogue the New York Historical Society’s extensive collection of Woolworth Building archives. Jason will lead us across the street to City Hall Park where we’ll examine the highly ornamented exterior of what was once the tallest building in the world. After discussing the Woolworth’s crucial importance to the development of the skyscraper and the New York City skyline, Jason will take us into the lobby, where he’ll share commentary on the vaulted ceilings and sculptural details. Following the tour, Untapped Cities history columnist Benjamin Waldman will lead guests to an optional cocktail hour at Fraunces Tavern. While you mingle with other members of the Untapped community, Ben will be on hand to discuss the evolution of New York City’s skyscrapers from Trinity Church to the World Trade Center, as well as the zoning changes they’ve necessitated. Tour has limited capacity. Tickets available for tour only, tour and cocktail-hour Q&A, or cocktail-hour Q&A only. Some years ago Frank Woolworth’s office used to be open to visitors. He was a Napoleon freak, and the office was full of Napoleonic memorabilia. I wonder if the office is still intact inside the Woolworth Building. Does anyone know?